Thanks to the president’s hard-right policies and a base increasingly supportive of Palestinians, Democrats must confront tough questions like where to locate the U.S. embassy. Democrats hoping for a united front against President Donald Trump in 2020 are trying to avoid splintering over an increasingly thorny topic: the Israeli-Palestinian conflict. With an energized progressive base increasingly supportive of Palestinian rights, and a president who is stridently pro-Israel in his policy moves, Democrats are starting to grapple more than ever with the party’s once-reflexive support for Israel. The 2020 Democratic presidential contenders are saying little publicly as they balance the competing interests. But in the meantime, pro-Israel Democrats are scrambling behind the scenes to shore up support, providing Holy Land trips to members of Congress and proposing policies they hope can bridge a growing party divide. Against this backdrop, Democratic Rep. Ilhan Omar of Minnesota — one of the first two Muslim women ever elected to Congress — apologized on Monday for what many regarded as anti-Semitic criticisms she leveled on Twitter. The controversy, coupled with the substance of the overall policy debate, has concerned Democratic consultants as much as it encourages Republicans who hope that Trump’s support of Israel will allow them to peel off Jewish voters, a key Democratic constituency. Among the questions faced by the party and its growing list of Democratic presidential candidates: Should the United States move its embassy from Jerusalem back to Tel Aviv? Should the Democratic Party platform use the word “occupation” to describe lands claimed by Palestinians? Is the pro-Palestinian “boycott, divestment and sanctions” movement an acceptable form of protest against Israel? That last issue, nicknamed “BDS,” has laid bare the divisions among Democrats. Of at least seven U.S. senators running or considering vying for the Democratic presidential nomination, six of them — Cory Booker, Sherrod Brown, Kirsten Gillibrand, Kamala Harris, Bernie Sanders and Elizabeth Warren — recently voted against a measure from Florida Republican Senator Marco Rubio that would allow state and local governments to not do business with companies that support boycotting, sanctioning and divesting from Israel. 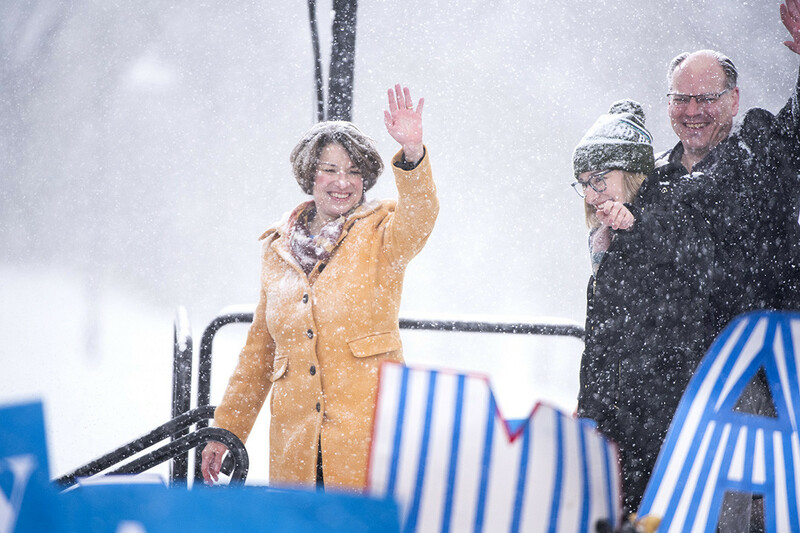 Democratic Sen. Amy Klobuchar — who has declared she is running for the White House — voted with the majority when the legislation passed, 77-23, last week. Klobuchar is known for her strong support of Israel and had a rabbi at the launch of her presidential campaign this past weekend. In total, Democrats accounted for 22 of the “no” votes and 25 of the “yes” votes on the overall package, which also included other measures related to the Middle East. Middle East watchers say that a decade ago, the anti-BDS aspect would have garnered almost no opposition. The anti-BDS piece of the package may not survive the Democratic-controlled U.S. House, where Omar and fellow Muslim American Democratic Rep. Rashida Tlaib of Michigan have emerged as outspoken supporters of Palestinian rights. The caucus’s freshman sensation, New York Rep. Alexandria Ocasio-Cortez, has also tweeted remarks perceived as more sympathetic to Palestinians than Israel. Booker of New Jersey made perhaps the biggest pivot; last year, he co-sponsored a similar bill aimed at undermining the boycott movement. But he voted against the recent measure that moved in the Senate. Like many of his potential 2020 Democratic rivals, Booker explained his vote on grounds that the measure could threaten people’s First Amendment rights. “There are ways to combat BDS without compromising free speech, and this bill as it currently stands plainly misses the mark,” Booker said in a statement. Nonetheless, Republicans are using the measure to paint Democrats as weak on Israel, and the vote has added to the unease among pro-Israel groups such as the American Israel Public Affairs Committee, or AIPAC. Warren also faced critical coverage over Israel recently when The Jerusalem Post noted that she failed to push back on the description of Israel as “an apartheid state” during a question-and-answer moment in New Hampshire. The critical tenor of that question underscores the drift of the Democratic Party over the years. According to a Pew Research poll last year, 79 percent of Republicans sympathize more with Israel than the Palestinians but only 27 percent of Democrats feel that way. The poll also found that Republicans’ support for Israel over Palestinians had increased by 29 percentage points since 2001, while Democratic support of Israel over Palestinians declined by 11 points in that same timespan. Still, a Mellman Group poll taken just before the elections last year found that 68 percent of Jewish voters identify as Democrats, while 25 percent identify as Republicans. And, compared to the population overall, 76 percent of Jewish voters held an unfavorable view of Trump — even though he was the first U.S. president to honor a longstanding commitment to move the U.S. Embassy in Israel to Jerusalem. But Trump also angered many in the Jewish community when he failed to clearly denounce neo-Nazis after the 2017 violent clashes in Charlottesville, Va., and for running a campaign supported by white nationalists. Still, the pro-Palestinian drift of the party has increasingly worried some Democratic activists. That fear is especially pronounced in Florida, home to both a large Jewish population and Trump’s Mar-a-Lago resort. Florida also is the nation’s largest swing state that’s central to Trump’s re-election hopes. “As far as that type of rhetoric from Omar and some of the debate driving Jewish people from the party, there is a definite risk if leadership doesn’t reject the promotion of BDS and anti-Semitism,” said Evan Ross, an AIPAC member and Democratic activist from Miami-Dade, Florida’s most populous county. Ross noted that the Democrats’ nominee for governor in 2018, Andrew Gillum, took heat from Republican Ron DeSantis over the BDS issue. When DeSantis narrowly won the governor’s mansion, even some Democrats cited his pro-Israel platform as a reason for the victory. “As a Republican, what’s happening in the Democratic Party is great politically for us. But it’s awful for the Jewish community and anyone who cares about the issues we care about,” said Matt Brooks, executive director of the Republican Jewish Coalition. The shifting views of Israel among Democrats are in part the result of years of lobbying by activists concerned about Palestinian rights. But the ascent of a hard-right government in Israel has accelerated the trend, making support for the country less reflexively bipartisan. Israeli Prime Minister Benjamin Netanyahu’s seeming disrespect toward former President Barack Obama upset many in the party, especially its African-American members. Many black Democrats skipped Netanyahu’s March 3, 2015, speech to Congress — in which he urged lawmakers to vote against the nuclear deal Obama negotiated with Iran. Democratic pro-Israel activists have stepped up lobbying since Democrats recaptured the House last November. In January, for instance, a group of national security experts, some of whom may join Democratic campaigns, visited Israel to get a lay of the political landscape, meeting with both Israeli and Palestinian leaders. The weeklong trip was organized by J Street, the left-leaning pro-Israel group that has battled for primacy with the more conservative and established AIPAC. Also last month, a new pro-Israel organization popped up in Washington. A big Democratic concern: how to handle the issue of the U.S. embassy in Jerusalem? Trump moved the U.S. Embassy to Jerusalem from Tel Aviv over Palestinian objections. The Trump administration also has moved to downgrade the status of the U.S. Consulate General in Jerusalem, the diplomatic mission that dealt directly with the Palestinians, who did not want to go through an embassy linked to Israel. One campaign platform proposal being floated among Democratic consultants is to keep the embassy in Jerusalem but reestablish a diplomatic mission — possibly something beyond just a consulate general — in a part of East Jerusalem that Palestinians claim for a future capital. “There are discussions taking place about how to recognize the Palestinians’ connection to the East Jerusalem, to rebalance the ledger after Trump’s attempt to take the issue of Jerusalem off the table,” said Dylan Williams of J Street. But more left-leaning activists say that may not be enough. For the most part, the numerous Democrats considering a White House run have not fully fleshed out their foreign policy ideas, much less their exact views on Israel and the Palestinians. Supporters of Sanders, the independent senator from Vermont eyeing a second run for the Democratic nomination, are expected to push for a mention of “occupation.” Sanders’ side lost that same battle, and the nomination, when he ran in 2016. More moderate 2020 candidates or those aligned more closely with Israel are likely to argue against language such as “occupation” on grounds that it could offend Israelis, who prefer terms like “contested” or “disputed” and in some cases question any Palestinian claim to the territories. Democratic activists stress that the 2020 election is still a political lifetime away, but acknowledge that when it comes to Israel, Republicans are far more united in offering uncritical support. That being said, there’s a strong belief that no matter who wins the Democratic primary, the party will unite behind them regardless of their stand on Israel. After all, for Democrats, the election is about Trump, said Miller, the Middle East expert.